A long-sought-after treasure of Careyana has been found! It’s Timothy’s Halloween commercial for Sambo’s restaurants, first aired on NBC-TV on October 29, 1980. Who is that at the very beginning, appearing from behind a newspaper as Frankenstein’s monster? I think we all know who! Happy Halloween, everybody! In honor of the imminent release of Steve De Jarnatt’s gem of a short film Tarzana (1978) on video (yes, finally! Watch this space! ), here is the director recalling his experience of working with Timothy on that film to Paul Rowlands of the Money Into Light film blog. How was working with the legendary Timothy Carey? 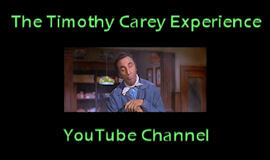 What can you say about Timothy Carey? There was only one. A brilliant, extremely complicated and odd performer and human being. Some say Tim, who was in Paths of Glory (1957) and The Killing (1956), was the reason Stanley Kubrick moved to England, and I sort of know why. Tim would call me a couple times a week after the film was shot and talk (or perform) for an hour – it could be a freaky sort of thing – and poor Stanley probably couldn’t take it. This is how Tim would roll with someone he trusted. Now I just regret I didn’t record all those rambling Dali-esque monologues of his. When I got my first professional gig in the 80s, directing the Alfred Hitchcock Presents episode “Man from the South” with John Huston and Kim Novak, Tim called up Universal and said he was my manager and was supposed to get 50% of everything I made. (In truth, my entire salary went to joining the DGA on that one). I sort of drifted off from contact with him, but when I was casting for my first feature, Cherry 2000, Tim began to hound me for the part of Six Finger Jake. I did go to bat for him, but the studio and producer nixed it. I was very fortunate to get Ben Johnson, but Tim never forgave me. I had betrayed him. Ah well. We planned on shooting ten days and after three days, Tim Carey had used up all the film. Well, that’s not true, I did. I sat there agape and watched him riff in these crazy improvs that had nothing to do with the movie. One of the improvs is its own little cult film, Cinema Justice (1977). We had to shut down production and look for more money. It’s Wednesday, and you may or may not remember what that means around here: it’s time for the Video of the Week! This week we bring you another of Timothy’s very early appearances on the small screen. It’s the Death Valley Days episode “Cynthy’s Dream Dress,” first airing on March 3, 1953. Tim’s very small part as a bartender begins at about the 10:35 mark. Don’t blink! The episode also stars Virginia Lee (D.O.A. ); Brad Johnson (Bedtime for Bonzo ); and Helen Brown (Shane ). Also appearing are two of Ed Wood‘s favorite character players, Lyle Talbot and Kenne Duncan. Enjoy! “The World’s Greatest Sinner” returns to TCM Underground tomorrow night! Set those DVRs, you Super Human Beings – Timothy’s mad masterpiece returns to TCM Underground tomorrow night, October 29! 11:30 PM PST, 2:30 AM EST! Check your local listings! Well look what I found on Dailymotion! The full length CHiPs episode “Kidnap,” first broadcast on January 26, 1980. Most definitely one of Timothy’s most eccentric performances. Tim’s cohort in crime here is Warren Berlinger, another venerable character actor born in Brooklyn (with the same birthday as me!). He’s been all over the big and small screens since the late 1950s. He is also Milton Berle‘s nephew! This week’s video accompanies the wonderful article by filmmaker Andre Perkowski (and was also created by him) that provided our Quote of the Week last Sunday. It comprises scenes from Timothy’s last television appearance in the Airwolf episode “Tracks” (3.22.1986) overlaid with the audio from Morgan Morgan’s near-soliloquy from Minnie and Moskowitz (1971). The result is surrealism at its finest. Enjoy!